Completely cleans Beauty Blender or other makeup applicators. 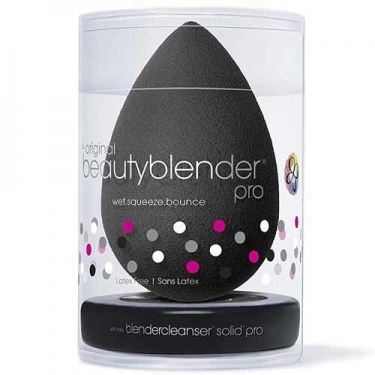 A Beauty Blender Pro, a sponge applicator, in a pro black, non-disposable, high-definition and independent color. 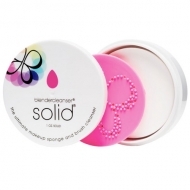 Featuring the same material as the original Beauty Blender, this sponge is the perfect application method for darker-colored products that would be difficult to wash from a lighter-colored applicator. 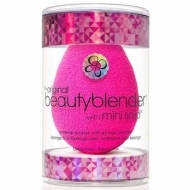 A Mini Blendercleanser Solid Pro to keep the beautyblender (and brushes) clean and in high performance mode. This product is enriched with charcoal for even more effective cleaning. 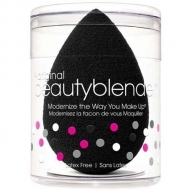 Apply makeup across the face with little touches without rubbing, until having achieved the desired coverage. Rinse thoroughly and dry in a ventilated area.